In addition to the storyline about Chani and Baruch there is also the story about the Zilbermans: Rabbi Chaim Zilberman, his wife and their son Avromi. They all belong to the Orthodox Jewish society in London, trying to cope with the usual and unusual hardships of life and love. It has been some time since I have read this book as I have not had time to write this review earlier. So, I hope I will remember all the names correctly, but I just cannot not do a review on this one. I want people to read this book because it was absolutely amazing! First of all, the characters. Oh wow, Mrs. Harris can create fascinating, amiable and unique characters! I absolutely loved reading about them and even though this book is told from different perspectives, there was not one moment when I wished that the chapter was over. 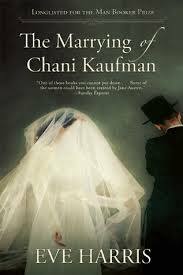 I very much enjoyed reading from Chani's perspective especially because she is so clueless when it comes to what happens after the wedding ceremony. But still she is not naive and I liked how she tried to find out about it. My second favourite character is Avromi, the Rabbi's son. His story absolutely broke my heart beacuse he is such a great character and what he went through made me cry. This was a book I didn't want to end because it was so interesting to learn more about the jewish religion and culture. I was intrigued from the beginning and I have to say that this book really challenged me because it contradicts almost all my beliefs and values. I have totally different opinions about love, equality and freedom and often it was hard for me to understand how the characters could have certain thoughts and not have others. But the author was able to keep me absorbed in the story at all times. The main question I asked myself while reading this book was if and when marriage or love in general work. Can it last forever at all whether the partners fall in love with each other and spend years together or whether they have only met a few times? The book didn't really answer my questions but now I think that it was good that Eve Harris did not try to give answers. Can I say that this book is perfect? For me at least, it is. I will definitely read this book more than once and I recommend it to anyone out there!